Molecular light scattering in dilute aqueous potassium chloride solutions has been studied. Anomalous (additional) molecular scattering of light is experimentally detected in the concentration interval from 0.001 to 0.004 mole fractions of the electrolyte. The obtained data are compared with the literature data on light scattering in aqueous and non-aqueous solutions of potassium chloride. The absence of additional scattering in the previous works was substantiated. M.F. Vuks, L.V. Shurupova. The scattering of light and phase in solutions of tertiary butyl alcohol in water. Opt. Commun. 5, 277 (1972). G.W. Beer, D.J. Jolly. Comments on "The scattering of light and phase transition in solution of tertiary butyl alcohol in water". Opt. Commun. 11, 150 (1974). M.F. Vuks, L.V. Shurupova. Light scattering and phase transitions in aqueous solutions of simple alcohols. Opt. Spektrosk. 40, 154 (1976) (in Russian). I.L. Fabelinskii. Molecular Scattering of Light (Plenum Press, 1968). V.Ya. Gotsul'skii, N.P. Malomuzh, V.E. Chechko. Features of the temperature and concentration dependencies of the contract of aqueous solutions of ethanol. Russ. J. Phys. Chem. A 87, 1638 (2013). V.E. Chechko, V.Ya. Gotsulsky, M.P. Malomuzh. Peculiar points in the phase diagram of the water-alcohol solutions. Condens. Matter Phys. 16, 23006 (2013). L.A. Bulavin, V.Ya. Gotsulskiy, V.E. Chechko, Light scattering by aqueous solution of alcohols near their singular points. Ukr. J. Phys. 59, 881 (2014). V.Ya. Gotsul'skii, N.P. Malomuzh, M.V. Timofeev, V.E. Chechko. Contraction of aqueous solutions of monoatomic alcohols. Russ. J. Phys. Chem. A 89, 51 (2015). V.Ya. Gotsulskiy, N.P. Malomuzh, V.E. Chechko. Particular points of water-alcohol solutions. Russ. J. Phys. Chem. A 89, 207 (2015). V.Ya. Gotsulskiy, V.E. Chechko, Yu.A. Melnik. The origin of light scattering by aqueous solutions of alcohols in vicinities of their singular points. Ukr. J. Phys. 60, 780 (2015). V.Ya. Gotsul'skii, N.P. Malomuzh, V.E. Chechko. The role of two-particle effects in the behavior of refraction of single-component liquids and two-component solutions. Optics Spectrosc. 120, 615 (2016). V.E. Eskin, A.E. Nesterov. Anomalous light scattering in non-dissipating solutions and level of fluctuations. Ukr. Fiz. Zh. 9, 540 (1964) (in Russian). G.P. Roshchina, A.S. Kaurova. Research of fluctuations in non-aqueous electrolyte solutions by light scattering method. Ukr. Fiz. Zh. 9, 512 (1964) (in Russian). L.A. Bulavin, V.Ya. Gotsulskiy, V.E. Chechko, Peculiarities in the establishment of equilibrium state in diluted aqueous solutions of ethanol. Ukr. J. Phys. 59, 689 (2014). A.P. Filippov, A.I. Amirova, A.V. Ten'kovtsev. Establishment of equilibrium in solutions of thermoresponsive polyoxazoline after discrete temperature changes. Fibre Chem. 47, 144 (2015). L.A. Bulavin, V.Y. Gotsul'skii, N.P. Malomuzh, V.E. Chechko. Relaxation and equilibrium properties of dilute aqueous solutions of alcohols, Russ. Chem. Bull. 65, 851 (2016). M.F. Vuks. Light Scattering in Gases, Liquids, and Solutions (Leningrad State Univ., 1977) (in Russian). E.A. Masimov, H.F. Abbasov. Hydration numbers of ions in aqueous solutions of KOH, KCl, KI, and KIO according to refractometric data. Russ. J. Phys. Chem. A 87, 1430 (2013). N.P. Malomuzh, E.L. Slinchak, The cluster structure of dilute aqueous-alcoholic solutions and molecular light scattering in them. Russ. J. Phys. Chem. A 81, 1777 (2007). M.A. Kazaryan, I.V. Lomov, I.V. Shamanin. 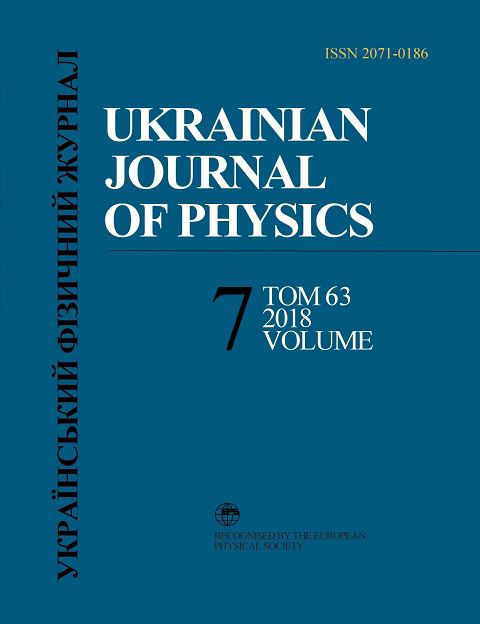 Electrophysics of Structured Salt Solutions in Liquid Polar Insulators (Fizmatlit, 2011) (in Russian). N.P. Malomuzh, E.L. Slinchak, Anomalous Increase of the Landau–Placzek ratio near the pseudospinodal in diluted aqueous-alcoholic solutions. Ukr. J. Phys. 53, 966 (2008). N.P. Malomuzh, K.N. Pankratov, E.L. Slinchak. Self-diffusion processes in diluted water-alcohol solutions. Ukr. J. Phys. 53, 1080 (2008). A.D. Alekhin, B.Zh. Abdikarimov, L.A. Bulavin, Yu.L. Ostapchuk, E.G. Rudnikov, Ye.T. Shimanskaya. Equation of state near the critical point on the basis of the van der Waals model for a wide class of dielectric liquids. Ukr. J. Phys. 55, 897 (2010). A.D. Alekhin, Yu.L. Ostapchuk, E.G. Rudnikov. Equation for the coexistence curve of alkanes near the critical temperature. Russ. J. Phys. Chem. A 85, 537 (2011). V.E. Chechko, V.Ya. Gotsulskiy, V.G. Zaremba. On the nature of the relaxation process in dilute water-glycerol solutions. J. Mol. Liq. 105, 211 (2003). B.A. Pethica, C. Smart. Light scattering of electrolyte solutions. Trans. Faraday Soc. 62, 1890 (1966). G.P. Roshchina. Investigation of fluctuations in solutions by light scattering method. In Critical Phenomena and Fluctuations in Solutions (Izd. Akad. Nauk SSSR, 1960), p. 109 (in Russian). G.D. Parfitt, J.A.Wood. Light scattering from binary mixtures of water, methanol and ethanol. Trans. Faraday Soc. 64, 2081 (1968). I.A. Yakovlev, T.S. Velichkina, L.F. Mikheeva. Molecular light scattering and a - b transformation in quartz. Kristallografiya 1, 123 (1956) (in Russian). I.A. Yakovlev, T.S. Velichkina. Two new phenomena in phase transformations of the second kind. Usp. Fiz. Nauk 63, 411 (1957) (in Russian). V.E. Chechko, V.G. Zaremba. Molecular interaction in solutions with a strong hydrogen bond. Khim. Fiz. 12, 1036 (1993) (in Russian). V.E. Chechko. Light scattering in aqueous glycerol solutions. Ukr. Fiz. Zh. 46, 920 (2001).